• Richard Gunderman debunks myths surround the 1918 flu pandemic to increase understanding about potential future pandemics. • How can funders use this information to prioritize pandemic prevention funding? To what extent is the public’s understanding of pandemics important in preventing and mitigating future pandemics? • Find out why the U.S. is not prepared for the next pandemic. 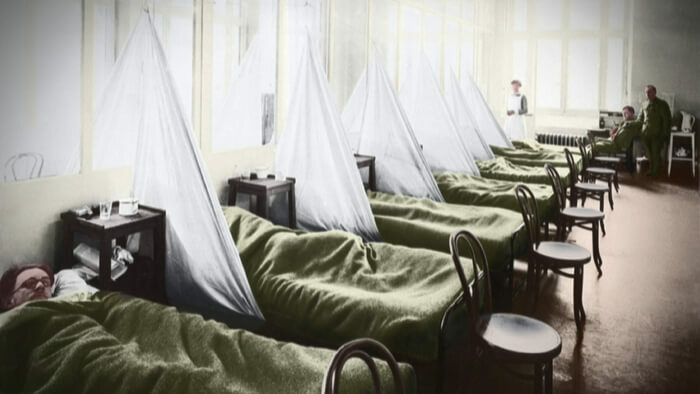 2018 marks the 100th anniversary of the great influenza pandemic of 1918. Between 50 and 100 million people are thought to have died, representing as much as 5 percent of the world’s population. Half a billion people were infected. By correcting these myths, we can better understand what actually happened and learn how to prevent and mitigate such disasters in the future. No one believes the so-called “Spanish flu” originated in Spain. The pandemic likely acquired this nickname because of World War I, which was in full swing at the time. The major countries involved in the war were keen to avoid encouraging their enemies, so reports of the extent of the flu were suppressed in Germany, Austria, France, the United Kingdom and the U.S. By contrast, neutral Spain had no need to keep the flu under wraps. That created the false impression that Spain was bearing the brunt of the disease. In fact, the geographic origin of the flu is debated to this day, though hypotheses have suggested East Asia, Europe and even Kansas. The 1918 flu spread rapidly, and has long fueled the supposition that the strain of influenza was particularly lethal. However, more recent study suggests that the virus itself, though more lethal than other strains, was not fundamentally different from those that caused epidemics in other years. Much of the high death rate can be attributed to crowding in military camps and urban environments, as well as poor nutrition and sanitation, which suffered during wartime. It’s now thought that many of the deaths were due to the development of bacterial pneumonias in lungs weakened by influenza. Read the full article about debunking 1918 flu pandemic myths by Richard Gunderman at The Conversation. Since you are interested in Diseases and Cures, have you read these selections from Giving Compass related to impact giving and Diseases and Cures? Diseases and Cures is an important topic. Other members found these Giving Funds, Charitable Organizations and Projects aggregated by Giving Compass to be relevant to individuals with a passion for Diseases and Cures.